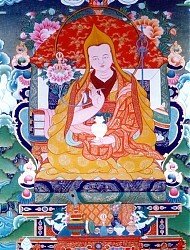 Lelung Shyepé Dorje (Tib. སླེ་ལུང་བཞད་པའི་རྡོ་རྗེ་, Wyl. sle lung bzhad pa'i rdo rje) (1697-1740) was a prolific author and an important master of both the Gelugpa and Nyingma traditions who is perhaps most famous for his writings on the origin of various Dharma protectors, entitled Liberation Stories of an Ocean of Oath-Bound Protectors of the Teachings. He was among the earliest masters to reveal practices related to Ling Gesar. This page was last edited on 18 January 2018, at 01:10.